Flexi-Liner is intended for use as a liner in masonry chimneys used to vent gas-fired appliances with draft hoods and appliances intended for use with Type B gas vents. Flexi-Liner is recommended for appliances with an AFUE rating of 83% or less. For appliances with greater than 83% AFUE ratings, environments which have excessive chloride and/or sulfide levels, or where condensation is likely to occur, always use an AL 29-4C stainless alloy system. Flexi-Liner is UL Listed to the 1777 Standard for gas relining in masonry chimneys. It is made of two-ply, 3003 aluminum and features a 15-year prorated, limited warranty. It has a unique, gas tight, patented seam, and its super flexibility makes installation easy, even in the most challenging chimneys. Flexi-Liner comes in UPS shippable kits: 3", 4", and 5" diameters are available in 25' and 35' lengths, and 8" diameter is available in a 25' length. Please note the actual outside diameter of Flexi-Liner is approximately 3/8" larger than its inside diameter. Choose your size from below. 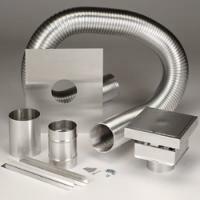 Browse these categories under "Flexi-Liner Aluminum"